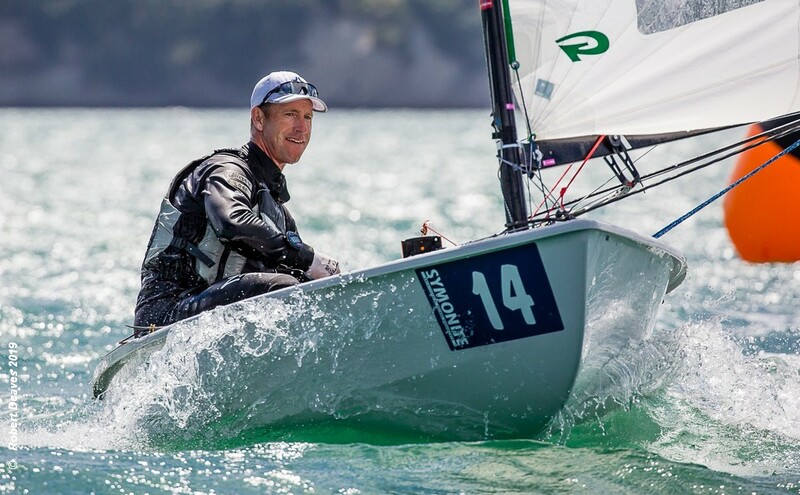 Dan Slater is the new leader after two races on day 3 of the Symonite OK Dinghy Worlds at the Wakatere Boating Club, New Zealand. Josh Armit is now second, nine points off the leader and Andrew Phillips completes the all Kiwi podium in third place. Slater and Fredrik Lööf (Image) took the race wins in another day of offshore shifty winds. Phillips is tied on 18 points with fourth placed Fredrik Loof of Sweden, with Luke O’Connell and Steve McDowell on twenty points in fifth and sixth places. Britain’s Nick Craig is now in seventh place, but 19 points off the leading group. Richard Burton, who took a race win on day 2, was not so lucky today, posting a 57 and 19 to place 32nd overall. But a better day for Rohan Lord of New Zealand, following a DSQ and a DNC yesterday, the veteran bounced back with a 2 and 9 scoreline. Event leader Dan Slater has competed at the Olympic Games for New Zealand in the 49er and the Finn, with a best finish of seventh in the Finn at the 2012 Games. With five races and a valid series now sailed, the fleet can have a well-deserved day off on Wednesday. The series concludes on Friday 15 February.